There it sits: a dirty metal box holding eight cubic yards of old meat, chicken bones, secret sauce, fried fish, vegetables, soft drink residue, greasy fries and wrapping paper all rotting in the heat. Yummy! Trash bags and garbage are strewn around it. Why? Because the trash pick-up schedule is inadequate, so the dumpster is often full to the brim. Also, there are always some people, whatever their reasons, who simply refuse to place trash bags inside a dumpster. They prefer to toss the bags in its general direction. The next trash pick-up for our dumpster is not until tomorrow morning. Worse, the dumpster’s top is rarely closed (and in the case pictured, both rain covers are broken, a common problem). The smelly, deteriorating garbage, then, will be openly available throughout the night. The dumpster’s drain plug is long gone. A flow of liquid oozes onto the slab and downhill to soil nearby, creating a rich organic goo. 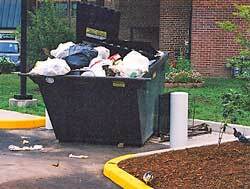 The dumpster itself is rarely cleaned, and there is a build-up of crud on both inside and outside surfaces. A side seam has split. Each time the trash truck bangs the dumpster up and over its back to empty it, the seam opens a bit wider. Trash bag on ground behind school dumpster. Note dirt kicked out by rats in burrowing along brick wall. 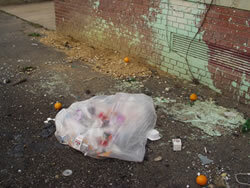 Poorly managed dumpsters have many bad characteristics which attract pests. Rats in the area will zero in on the high quality food readily accessible each evening, and take up residence nearby. Not only do the rats have access to the food trash on the ground, but they can get inside the dumpster itself through the drain plug, split seam, or open top. Would anyone really be surprised to find rats burrowing under the edge of a pad under such a dumpster, or under slab edges and landscaping nearby? A messy dumpster can also become a fly haven. House flies will zoom in to feed on the food and food scum in, on, and around it. Blow flies will be attracted to rotting meat and fish. Drosophila flies (“fruit” flies) will breed in fermenting fluids from rotting fruits and vegetables. The flies will not only become pests around the dumpster, but will find their way into nearby buildings. Other pests commonly attracted to dumpsters include ants, mice, pest birds (note pigeons in first picture), bees, wasps, and cockroaches.